MegaMan Powered Up : Master Level List! Welcome to the MegaMan Powered Up : Master Level List! Here you can search through hundreds of user-created stages for review, download, and information! You can even sign-up and submit your own stage to be downloaded and reviewed by your fellow MegaMan Powered Up fans just like you! This is Version 3.0 of the Master Level List - now loaded with tons new features to make your time here that much easier as well as more fun and exciting! Welcome to the new Powered Up site and I really hope you enjoy your stay here! Also, don't forget to read the Help if this is your first time here in a while, it's changed a lot! Here is a totally random stage picked out of nowhere. Is this a jewel or a dud? If you're interested, why not have a click and find out? Here are the three most recent stages added to the Master Level List! Go ahead and take a look! See if you like! And of course, if you wanna see more just click the Stages option at the top of this page. Remember, in order rate stages you must be logged in. (More about that on the Help page). 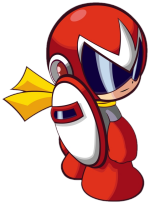 "It's the path to Cutman!!"